It is not unusual for one game genre to not be enough to keep you occupied. While I do have ARTS/MOBA and MMORPGs as my main genre (although there have not been very many good MMORPGs for a while…), racing and car games have always had a soft spot in my heart. It just feels great to relax and drive or terrorize the track with the roars of your engine. 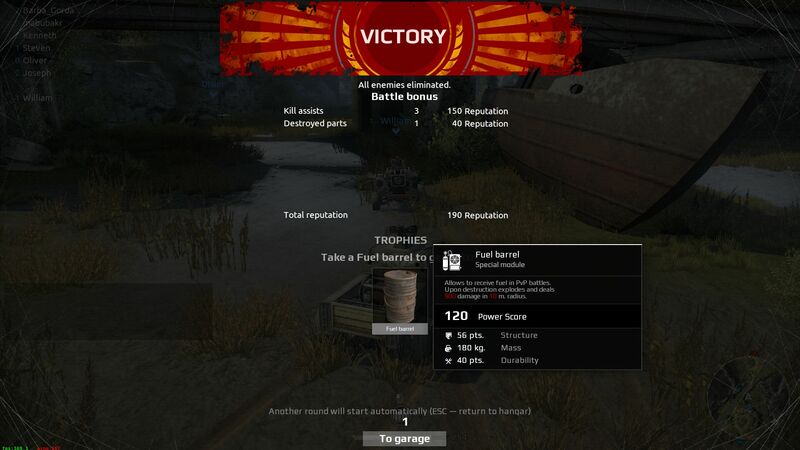 While Crossout is a game where players drive vehicles, it is much more than that. 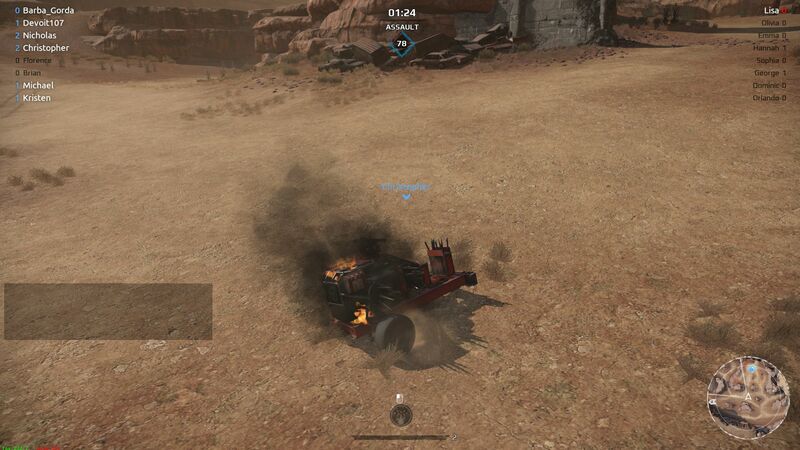 This game can quickly be described as: MadMax + Motorstorm + Robocraft. 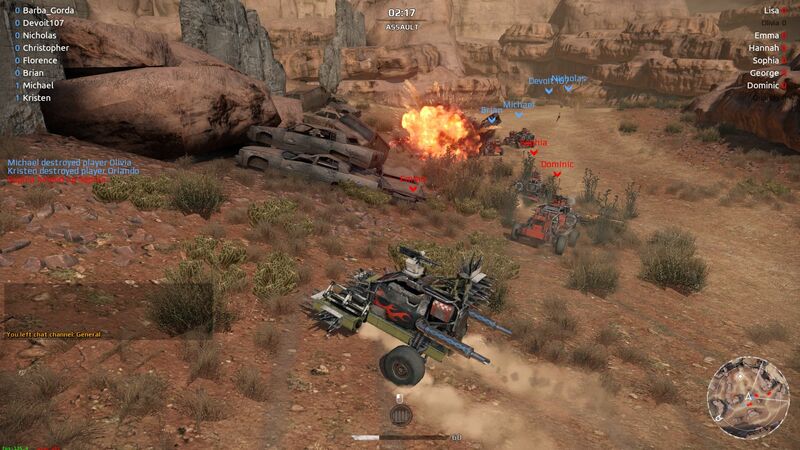 Read on for my first impressions of Crossout. For those unfamiliar with the games used to describe Crossout, don’t worry, the game is very easy to understand. Players craft their own unique battle machines, ride them directly into combat, and destroy their enemies in online PvP battles. The overall idea behind the game is very simple but each of these key elements bring a lot to the table. Seeing them all work as a united game is a marvel of game development. The PvP battles are always fast paced and action packed. In Crossout, players will be driving their own uniquely crafted vehicles. The crafting or building process in Crossout is amazing. 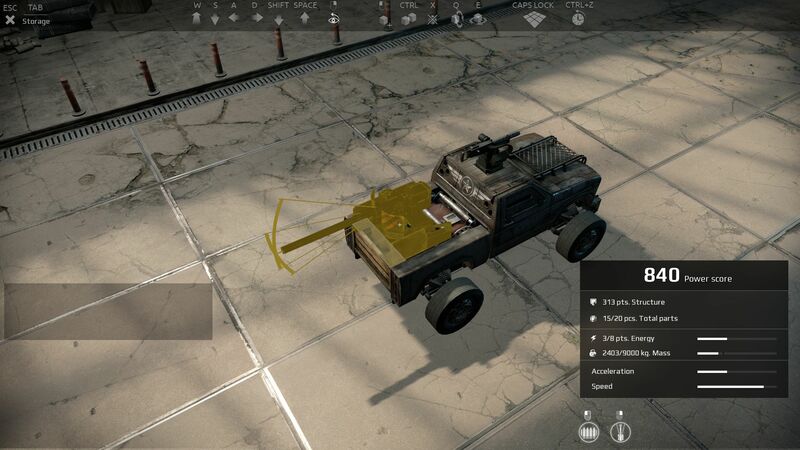 Using the in-game editor, players can build their own unique vehicles from scratch. You are only limited by your imagination (and of course, being a MMO, the items in your inventory…). Everything in the game can be seen as a building block with some set dimensions, similar to how LEGO works in the real world. 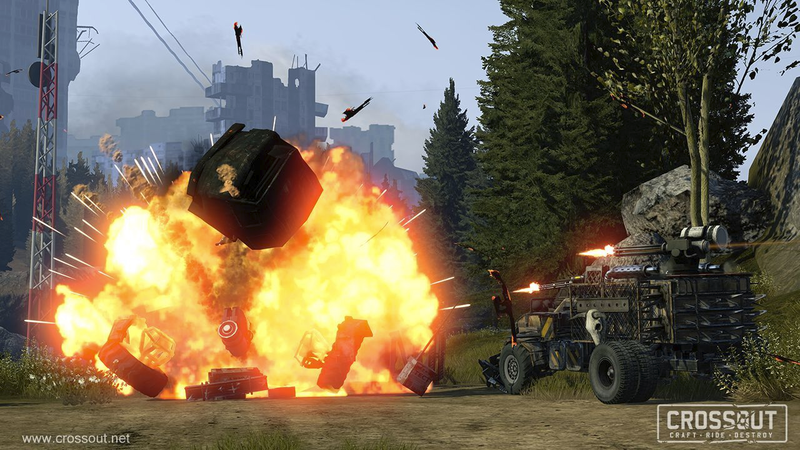 Players can choose between various items such as tires, engines, windows, turrets, and even rocket launchers before combining them into your personal unique snowflake of doom. You can build fast and light vehicles or slow tanks; it is up to you. I personally like my normal pick-up truck type vehicle with a machine gun and grenade launcher. It’s simple and does not excel in any particular category but is well balanced and does the job. The crafting system is very intuitive and easy to use. If I could assume that I had all the equipment available to me for crafting, I would go for a very mobile vehicle that can fight from afar. I love to stay back and fight from a distance. When danger comes to me, I prefer to back off to a better position. 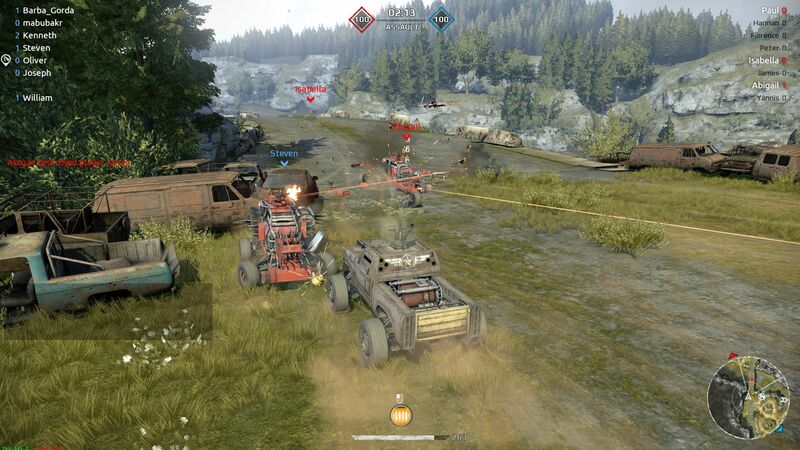 Fighting from the backlines has always been my playstyle in all games and it would be great to continue this style in Crossout. Fortunately, the great crafting system makes this very possible given enough time to grind out the materials. After you are happy with your crafted vehicle, it is time to ride it into battle. The controls are very straight forward, using the keyboard’s WASD keys to drive and my mouse to aim and fire both my primary and secondary weapons. Usually keyboards are horrible for car games but since this is more of a car fighting game, the keyboard works perfectly fine. You will very rarely need the precise turning available with a steering wheel or controller. Overall, the controls are very intuitive and easy to use. The controls let you do whatever your vehicle is capable of in battle. What it is capable of is up to you depending on your crafting ability and creativity. 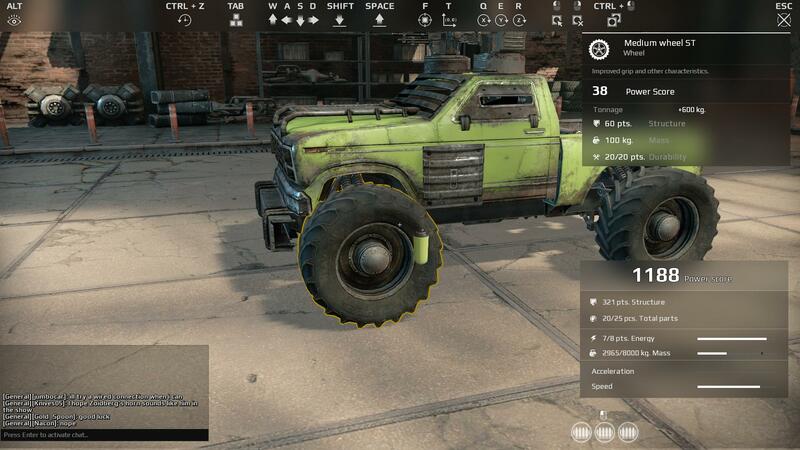 Your vehicle can take any shape so long as it’s functional within the physics engine; it can be a tank with tracks or a traditional four wheeled SUV. While the controls may be amazing, it is up to you to ensure that you do not construct an awkward vehicle. The game does a good job in helping you out but there’s no gutter guards preventing you from rolling into a match in a tin garbage can. Fortunately, there is a test drive mode available so you can try out your creation before jumping into a live battle. In battle, all players work to destroy their enemies. PvP matches are team based and either team can come out victorious by either destroying all enemy vehicles or capturing all objectives. Additional game modes are likely to be added in the future, but the beta only offers a control point game mode. It is important to note that there is no respawning; if you die, you are out until the end of the match. This makes it essential to play smart and not ‘rambo’ into battle. However, I have noticed that in the majority of matches everyone just fights to the death instead of focusing on objectives. Oh well, that works too as you can still win by eliminating the enemy team. Your vehicle can break down piece by piece if it takes damage. My favourite part of the PvP battles is the damage system. This may just be my developer side coming out, but I found it amazing that each part of your vehicle is treated as a separate entity and can break independently. You are not faced with a boring binary HP system where you are either alive or dead. Instead, real damage is reflected based on where you are hit. Is an enemy’s turret giving you trouble? Break it off! Is an enemy vehicle too fast for your liking? Shoot off its wheels! It’s great to see a damage system that is much more interesting than the simple ‘alive’ or ‘dead’ system found in the majority of online shooters. All the battles are very fast paced and always action packed. However, I am not a big fan of the mission system used to enter these battles. All these ‘missions’ do is change the potential drops and limit the level of players. It doesn’t matter what mission you are doing, the objective of all battles will be the same. The mission system is simply used to farm the items and equipment you are interested in. However, this system does allow you to play against players around your skill level as every mission has a level requirement which must be met before you can queue for it. Players are rewarded with items at the end of each battle. Combining the elements of crafting, riding, and destroying together results in a game that is fun to play. I am a huge fan of the crafting system because it is so simple and novice friendly to learn to use, yet doesn’t limit the wild expanse of creativity even this early in beta. There are still some areas such as the environment and sound effects which could use some work, but the game is in an amazing state for being in beta. I am looking forward to the evolution of this game and hope to see many gamers playing soon. I do not have much experience at the higher levels in Crossout so I cannot comment for sure, but this game could be viable as an eSport. It would be great to see a digital version of Robot Wars. Hopefully the cash shop system does not completely knock free to play players out of the competition. Looking forward to what this game has in store upon full release!